In traditional Japanese architecture, a shōji (障子) is a door, window or room divider consisting of translucent paper over a frame of wood which holds together a sort of grid of wood or bamboo. While washi is the traditional paper, shōji may be made of paper made by modern manufacturing processes; plastic is also in use. Welcome to the Shoji Guide. On this website you will be able to find suppliers for all different types of Shoji designs. The main types of Shoji are divided into a few categories such as Shoji screens, Shoji doors, Shoji lamps, and finally Shoji paper. Having the proper Shoji materials is especially important when decorating your living spaces and there are quite a few choices you can make when selecting different types of paper. With the proper material, your new Shoji designs will bring a minimalist decor to your living space. SHOJI SCREENS. The actual screens which make up Shoji dividers can be built to differnet sizes, or just purchased outright in pre-made dimensions. A shoji screen is usually made of wood. Each square section in the panel is filled with Shoji. Shoji is a vinyl coated fibreglass that is generally translucent. It looks and feels like rice paper. 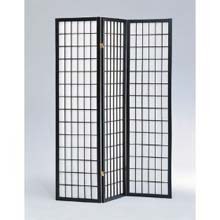 A shoji screen usually has 3 panels and is foldable. They are generally very light. This makes them every easy to both to store and move around your home. When you first set about looking to incorporate Shoji screens into your home/office decor, you can either construct them yourselves, or order them from many different sources. SHOJI DOORS. These are predominately sliding doors made up of 2 or more Shoji screens. Also available are inset Shoji doors which replace common western style architecture. I'm not talking about the front door of the house, but rather the doors found inside the home. 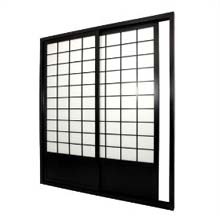 There are quite a few different frames that you can choose from when searching for Shoji doors. You can get more info on this category by visiting the Shoji door page on this website. SHOJI PAPER. This piece of the design brings out the personality of the Shoji design. Although there exist numerous types of Shoji paper, there's really only a few that you need to become aware of. Shoji paper can be delivered in a traditional style, a extra-strength version, a wildly textured style, and finally an organic rice-paper version. Most available Shoji paper originates from Japan, although distribution has become somewhat decentralized due to rising popularity of the Shoji design. Shoji paper supplies can be found in major cities throughout the world. SHOJI LAMPS. 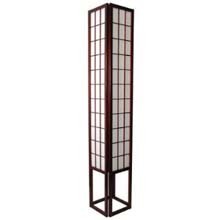 And finally, Shoji lamps are the best choice to match your choice of Shoji doors and screens. These lamps are commonly sold in a few design options such as floor lamps, table lamps, sconces, and even Shoji chandeliers. More info can be found on the Shoji lamp page on this website. © 2009 ShojiGuide.com All Rights Reserved.